I was recommended to Shaun because of my knee constraints. 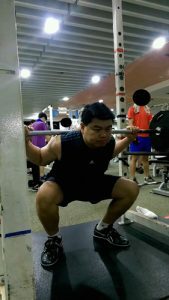 He took the time to understand my condition and designed a strength training regime on what I needed to build up my overall strength building to supplement my knee constraints. He was meticulous and careful to ensure my technique was correct. I was especially impressed by how I was able to build my strength gracefully without having to suffer the aches and pains usually associated with strength training. I found Shaun to be very passionate and knowledgeable about this profession and would recommend anyone looking for a trainer to him.